Ranked the sixth largest city in California, Oakland is the transportation, education, cultural, recreational and shopping center of the East Bay, a dynamic city with an international flavor. Proud of its heritage Oakland combines tradition with progress as major corporations and government offices find the city not only a prosperous business center, but a desirable place to live. One of Oakland's many strengths is its many distinctive neighborhoods, each with its own history. From the bustling Fruitvale District to the trendy shops and cafes along College Avenue in Rockridge. 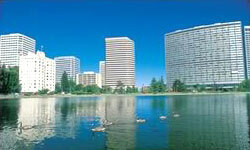 Beautiful Lake Merritt offers outstanding picnic sties, jogging trails and boating opportunities.